It has been estimated that every death on Northern Ireland’s roads costs the Northern Ireland economy up to £2m. More importantly, the cost to the many bereaved families cannot be measured. Amid continuing government cuts, a patchy roads infrastructure and increasing distractions for drivers, Detail Data has investigated the impact of two years of road collisions. Kathryn Torney reports. SIXTEEN people lost their lives on Fermanagh’s roads in the last two years – making it the police area in Northern Ireland with the highest death toll from collisions. The deaths include six separate fatal crashes on the main A4 road out of Enniskillen which leads to the M1 motorway. There were also three fatal collisions on the A47 which runs from Kesh to Belleek. There were 12 deaths in Newry and Mourne PSNI area. All other police areas had less than 10 fatalities. Sixty-three people were seriously injured in crashes in the Fermanagh area during 2013 and 2014. This comes against the background of poor infrastructure in the Fermanagh area and government failure to deliver the A5 road scheme - which would have resulted in the road from Ballygawley to Derry, via Omagh and Strabane, being upgraded to dual-carriageway. Of all the 129 fatal collisions recorded across Northern Ireland over the two year period, 74% took place on rural roads where there are speed limits of over 40mph. There was only one fatal crash on a motorway. Detail Data is today reporting on the devastating impact of road collisions in Northern Ireland. We have analysed PSNI statistics relating to 1,321 collisions in 2013 and 2014 which led to the death or serious injury of drivers, passengers, cyclists, motorcyclists and pedestrians. In total 136 people were killed across Northern Ireland and 1,430 were seriously injured. • Almost a quarter of the people killed on Northern Ireland’s roads in the last two years were young men aged between 17 and 24. Of all deaths, almost 80% were male. • The death toll includes 54 drivers, 25 pedestrians, 23 motorcyclists, 16 front seat passengers, 10 rear seat passengers, 7 cyclists and 1 pillion passenger. • Lisburn PSNI area had the highest number of crashes in total – 100. The lowest number was in Cookstown in Co Tyrone – 20. • There is a strong gender imbalance. 106 males were killed and 938 seriously injured during 2013 and 2014 – compared to 30 females killed and 492 seriously injured. • 637 incidents were single vehicle collisions, 587 involved two vehicles and 80 three vehicles. One incident – a serious collision in west Belfast in September 2013 – involved nine vehicles. One person was seriously injured and 14 were slightly injured. • More than a quarter (27%) of people killed were aged 65 or over. • Of the 298 people killed over a 5 year period (2010-14), 37 were not wearing a seatbelt. • Despite the common perception that drivers are now well aware of the dangers of drink driving, it remains a serious issue. The top three principal causes of fatal collisions over the last five years in Northern Ireland were drink driving, followed by excessive speed and then inattention/attention diverted. Our interactive map shows the location for every fatal and serious crash in the last two years. There is also information on the speed limit on the road and a breakdown of the casualties. As of today, 41 people have been killed so far on our roads in 2015. The father of 25-year-old James Stewart from Saintfield tells us how his son’s life changed completely after he was seriously injured in a horrendous road crash in 2007. James suffered a severe brain injury along with other life-changing injuries and has had to learn how to walk and speak again. Click here to read James's story. We also speak to the father of a Derry man killed in a road crash in December 2000 about the “totally devastating impact” of his death on his family. Click here to read this story in full. Meanwhile, the Department of the Environment has confirmed that the budget for road safety communications, grants and educational materials has been cut to just over £1m for 2015/16. This is almost half of the £1.9m allocated in 2014/15. Using Freedom of Information legislation we requested a detailed breakdown of all fatal and serious road collisions which took place during 2013 and 2014. The data we received from the PSNI includes the date, time and location for each incident, road type, speed limit on the road and light, weather and road conditions. We also received the age and gender of all of the casualties involved in fatal and serious collisions over the two year period. Collisions are categorised as either ‘fatal’, ‘serious’ or ‘slight’ according to the most severely injured casualty. ‘Killed’ covers anyone dying within 30 days from injuries received in a collision. ‘Serious’ relates to people staying in hospital or injuries which include fractures, concussion, internal injuries, burns and severe cuts. Separately, the PSNI sent us information on seatbelt use and causation factors over a five year period (2010-14). The police statistics only relate to collisions that take place on public roads. And not all collisions are reported to the police. The PSNI classifies rural roads as those with a speed limit of greater than 40mph. Urban roads have a speed limit of less than or equal to 40mph. The data we analysed shows that 95 (74%) of the 129 fatal collisions took place on rural roads and 34 were on urban roads. 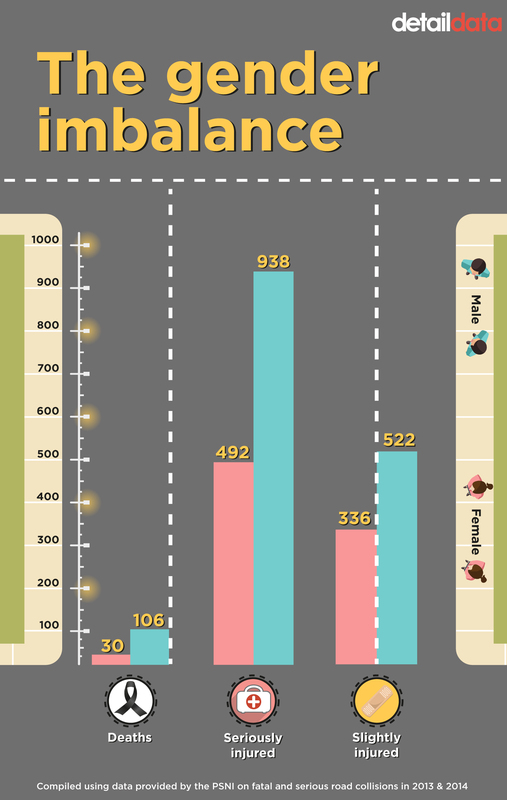 For serious collisions, 599 took place on urban roads, 593 on rural roads. Of all the fatal collisions, 117 were on a single carriageway. Only one fatal accident took place on a motorway. In an interview with Detail Data, PSNI Inspector Rosemary Leech warned that “dangers lurk around every corner” on rural roads – including farm vehicles, walkers, slower moving vehicles and motorbikes. “Rural roads require that extra bit of attention,” she said. “We know that motorways and properly divided dual carriageways are generally quite safe. And where speed limits are 30 and 40 miles an hour, pedestrians are probably more at danger in those areas but we know that the number of collisions are generally lower. The Rural Community Network (RCN) is a regional voluntary organisation established by community groups to articulate the voice of rural communities on issues relating to poverty, disadvantage and equality. Aidan Campbell, the organisation’s public and policy affairs officer, expressed concern about the road death figures for rural roads. He said: “Every road death is a tragedy and in one way it’s no surprise that the majority of fatal collisions are happening on rural roads but I didn’t realise the proportion of road deaths was so high on rural roads. “For people living in rural areas access to a car is essential to access employment, education and services. On smaller roads, that are less well lit and have hazards, the margin for error is much smaller than in urban areas. “Most people living in rural areas know where dangerous stretches of road and other hazards are and modify their driving accordingly. It can be more problematic for people who don’t know a road as well. And obviously that knowledge is of no value if people are impaired whilst driving due to alcohol or inattention. Aidan said that every individual needs to take responsibility for how they drive and reduce their speed to suit the conditions, the type of road and how familiar they are with it. He continued: “With the cuts to public sector funding, the number of hazards that can be ‘engineered out’ will be fewer but the Department of Regional Development needs to ensure that it focuses investment on accident black spots and in places where there is a high probability of an accident to prevent fatalities. Detail Data has previously reported on gaps in transport infrastructure in Northern Ireland. Click here to read more. Figures provided by the Department of Regional Development show that £38,800 was spent on structural maintenance of the road network in Fermanagh council area between 2009/10 to 2013/14, but this doesn’t address the absence of dual carriageways and motorways. A total of 136 people were killed on Northern Ireland’s roads in the last two years – 57 in 2013 and 79 in 2014. Of those who died, 106 were males and 30 female. Three were children going to or from school. Thirty-seven of the people who died – 27% of all deaths – were aged 65 or over. Sixteen of them were drivers and 13 were pedestrians. This oldest age category made up more than half of all the 25 pedestrian deaths. Sean McGovern, a consultant in emergency medicine at the Ulster Hospital in Dundonald, has treated many people with a range of injuries from car accidents. He said: “We have had 136 deaths in Northern Ireland over the last two years. Roughly ten times that number will be seriously injured and then for every death there are around 100 minor injuries. Those injuries are spread across the emergency departments throughout Northern Ireland. “We can see more minor injuries and these will be soft tissue injuries to neck, back, limbs. Then there are a range of injuries which are more serious and life threatening, from brain injury to serious injury, abdominal and pelvic injury, spinal injury and serious limb injury, to eventually some people having unsurvivable injuries and death will result. “Having seen multiple cases of trauma, the hardest part of my job remains telling a relative unequivocally that their son or daughter has died. That remains the hardest part by far of the job because it is a unique tragedy to those involved. Mr McGovern also highlighted the potential long term impact for those people who survive accidents but are seriously injured. “They may be left with spinal injury and be wheelchair bound, may be left with brain injury, giving them the equivalence of a stroke, or long term pain. Also my experience is that some of them are left with significant psychological trauma in terms of flashbacks to the incident and anxiety with regard to driving. Inspector Leech described the 136 deaths on our roads in the last two years as “an appalling waste of life”. “When a death visits a family, it changes them forever and it changes their attitudes forever. It's just a pity we couldn't share that experience without actually having people die on our roads. If people had that news come to their door, I guarantee they would drive differently, they would think differently and they would act differently,” she said. “If people paid more attention we definitely would have fewer road deaths on our roads. “If you pay attention, all the other things will follow. If you pay attention, you will know that drinking and driving is a really bad idea. If you pay attention, you will be watching your speed. If you pay attention, you will wear your seatbelt and you will be aware of other road users round you and you will be aware of what they're doing and you will know how to respond and how to react. “It's about setting down that mobile phone, it's about not answering texts, it's about not looking at your social media behind the wheel. That's the sort of thing that we know happens. “And for young drivers, it is all about getting experience behind the wheel. It's about getting past your test and not thinking then immediately you know it all. Inspector Leech also spoke about the serious injuries which can have a major impact on people’s lives. “People can be left in wheelchairs, they can be left with traumatic brain injuries or an amputation. Those are just devastating, life changing injuries and we don't always hear that reported and we don't always see that. Reports to the police include a driver strapping her Ipad to her steering wheel with elastic bands to look at her social media while she drove. Other young people are taking part in drag racing on public roads. Mobile phone use by drivers remains a serious concern. Sam Knox is a director in the Road Safety Council of Northern Ireland – a voluntary group which aims to reduce death and serious injuries on roads through its network of local road safety committees. He said: “We do a lot of work with young drivers at post primary schools. Some of that work entails getting them to go out onto the public road with advanced drivers and assessing their driving skills and reporting back to them on what needs to be improved. Sam said that road deaths are tragedies families never get over. The Road Safety Council of NI is campaigning for changes. “The Road Safety Council is firmly committed to lobby to try and get change made to the law in terms of being caught as a driver using your mobile phone. We believe that, as is the case in England where they are looking at this in terms of new legislation, two strikes and a driver should actually lose their licence. “We also believe that an investment in terms of defensive driving skills training for the whole population would make a massive difference in terms of trying to reach the target that the Department of the Environment has set, which is the road to zero (deaths). “I believe that the risk reduction would be between 50 and 75 per cent in terms of collisions by defensive driver training. Davy Jackson is also a director in the Road Safety Council and a Northern Ireland Fire and Rescue Service driving instructor. He said: "Road deaths here had been coming down year on year since around 1972 but in the last few years they have started to go up again. "In the fire service it is horrendous to have to deal with road traffic collisions, especially if they involve young people but at the time we don't stop and think about it. We are focused on our training and helping people. "It is only afterwards when you go home and see your own children in bed at night safe that you can let yourself think about it. It affects us all. "Mobile phone use, speeding and drink and drugs use are major issues on our roads. Everyone thinks a collision won't happen to them but people need to slow down and pay attention. You do not want to be responsible for a death on the roads." The Department of the Environment has confirmed that its budget for road safety communications, grants and educational materials has been cut to just over £1m for 2015/16. This is almost half of the £1.9m allocated in 2014/15. Environment Minister Mark Durkan told Detail Data: “I am very concerned by the number of road deaths and seriously injured on our roads. My sympathy is with all of the families and communities affected by these tragedies. “Recent deaths serve as a reminder of the danger we all face when we use the road and it is for this reason that I have urged that everyone makes road safety a priority. “The main causes of deaths and serious injuries on our roads remain inattention or attention diverted; excessive speed having regard to the conditions; and alcohol or drugs. “All of these factors are facets of road user behaviour. People are distracted or do not pay attention to the road and to other road users, people choose to drive at excessive speed with regard to the conditions or to drink and drive. She added that 20% of new drivers have a collision in the first six months. The Road Traffic (Amendment) Bill currently before the Assembly includes a package of measures to tackle drink driving, to reform the learner and restricted driver schemes and to introduce a system of Graduated Driver Licensing which would provide new drivers with experience and skills gradually, over time, in lower risk environments. As of June, the DOE said 125 of the 224 action measures to reduce deaths and serious injury listed in the NI Road Safety Strategy to 2020 have been completed or ‘embedded’ in ongoing business. Click here to read our article on bereavement through car collisions and here to read about a family coping with serious injuries caused by a crash. • There is guidance on the Cruse website www.cruse.org.uk for people who have been bereaved through sudden death. The helpline number is 0844 477 9400 or email [email protected] To find out details of local area support offices across Northern Ireland, call the regional office on 02890 792419. • The PSNI data can be accessed on NICVA’s Detail Data portal. Click here. Click here to see full screen map. SIXTEEN people lost their lives on Fermanagh’s roads in the last two years – making it the area in Northern Ireland with the highest death toll from collisions. Sixty-three people were seriously injured in crashes in the area during 2013 and 2014. This comes against the background of poor infrastructure in the Fermanagh area and government failure to deliver the A5 road scheme – which would have resulted in the road from Ballygawley to Derry, via Omagh and Strabane, being upgraded to dual-carriageway. Detail Data, a joint project between investigative news website The Detail and the Northern Ireland Council for Voluntary Action (NICVA), is today reporting on the devastating impact of road collisions in Northern Ireland. It has analysed Police Service of Northern Ireland statistics relating to 1,321 collisions in 2013 and 2014 which led to the death or serious injury of drivers, passengers, cyclists, motorcyclists and pedestrians. It has mapped every incident on an interactive map and provided a breakdown of the number of crashes and casualties in each PSNI area. Almost a quarter of the people killed on Northern Ireland’s roads in the last two years were young men aged between 17 and 24. Of all deaths, almost 80% were male. The death toll includes 54 drivers, 25 pedestrians, 23 motorcyclists, 16 front seat passengers, 10 rear seat passengers, 7 cyclists and 1 pillion passenger. Our other interviewees include a hospital consultant, a bereaved family, senior PSNI road policing officers, the father of a man seriously injured in a crash, the Road Safety Council of Northern Ireland, the Rural Community Network and Brain Injury Matters. The father of 25-year-old James Stewart from Saintfield tells us how his son’s life changed completely after he was seriously injured in a horrendous road crash in 2007. James suffered a severe brain injury along with other life-changing injuries and has had to learn how to walk and speak again. We also speak to the father of a Derry man killed in a road crash in December 2000 about the “totally devastating impact” of his death on his family.